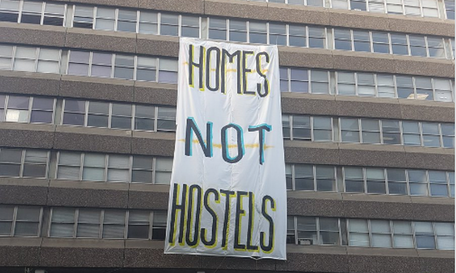 Apollo House, Tara Street, Dublin, a vacant property owned by NAMA which was occupied by Home Sweet Home in 2016 in protest against the perceived inactivity of the Government to tackle the homeless problem. The theme for the 17th Annual Winter Workshop, which took place on 28th January, 2017 at the Strand Hotel Omeath, against a backdrop of sparkling if chilly winter sunshine, was 'Housing and Homelessness: Falling Through the Cracks'. Three keynote speakers generously agreed to give of their time: Sean Brosnan, Niall Hayden and Michael Challoner. Sean Brosnan of the Monetary And Budgeting Advisory Service (MABS) provided a very informative talk on problems related to mortgage arrears. He opened his address by outlining how MABS had evolved out of the Credit Union movement about 20 years ago in response to the excessive interest rates being charged for short-term loans. However, in recent years much of its work has been focussed on providing support to people who have fallen into mortgage arrears as part of Abhaile - the Mortgage Arrears Resolution Service. The Insolvency Bill (2012) recognised that people were falling into difficulties because they COULD not pay their debt, not simply that they WOULD not pay their debt and the Insolvency Service of Ireland was set up. This provides support in four main areas, but the one of most relevance to the current topic is Personal Solvency. Personal Insolvency Practitioners (PIPs) sit down with the person with mortgage debt to develop a plan. Although the PIPs have no authority to write off debt, they can often get agreement from creditors to reduce or write off debt as an alternative to bankruptcy, especially in cases where the home-owner has fallen into negative equity. This allows the home to be safeguarded. Sean noted that there were very few repossessions before 2012, even though mortgages in arrears had increased from 35,000 in 2007 to 112,000 in 2012. He suggested there were two main reasons: (1) Creditors were waiting in the hope that equity would return, and (2) Repossessions required a decision by the High Court, but it took 9 months to get into the High Court, which in most cases adjourned the hearing for a further 9 months. The Code of Conduct for Mortgage Arrears introduced in 2012 reduced the risk of legal action if defaulters co-operated. They were required to submit income expenditure accounts which could be checked by creditors. If the mortgage proved to be unsustainable, there were three main response: (1) sell voluntarily; (2) surrender the property and walk away; or (3) mortgage to rent. The mortgage to rent approach has a lot of potential. The buyer (e.g. a local authority) needs to be identified who will buy the property and the owners then become tenants paying a rent, but they are allowed to remain in the house. The shortfall becomes secondary debt, not tied to the property, and in many cases was written off by the creditor. By 2016 the number of households in mortgage arrears had decreased by 2% to about 8% of the 738,000 households in the state. In the final quarter of 2016 there were 141 repossessions and 280 houses voluntarily surrendered or abandoned. One concern for the future is that negative equity depressed repossessions, but with equity returning creditors may become more proactive in trying to recoup their losses. A lot of the defaulted mortgage accounts are now being sold off by the banks to vulture funds which will presumably wish to see a return on their investments at some stage. Also repossessions can now be done in the Circuit Court which reduces the time it takes to complete them. Although the mortgage to rent scheme provides an attractive solution, in practice it tends to be overly bureaucratic and inefficient. In the four years since it was started, only 1600 transfers have actually been completed. Local authorities, for example, are only interested in buying properties in urban areas, so rural properties are in effect excluded. Paul Smyth, who chaired the meeting then invited questions. Dermot Mooney asked if the vulture funds provided a growing threat now that house prices were beginning to rise, but Sean said he thought they were in it for the longer term. Given that the debts are being sold off to vulture funds for about 30% of their value, several people asked whether they could not be sold to the home owners for the same price, but this apparently would not be very practical as the defaulters could not even afford the repayments on their existing loans. Dermot Mooney suggested that some people do not pay rather than being unable to pay, but Sean said that in his experience 'strategic defaulters' were actually very few in number. Sean noted that another option was a 'split mortgage' - i.e. the home-owner would continue to make repayments on part of the original loan, but a second portion would be 'warehoused' to be repayed later. The warehoused portion remained tied to the house but was often interest free, although some banks do charge interest. This worked well for some people, but others are saddled with an unrepayable debt. Mary Corrigan asked if there was any legal onus on the banks to take responsibility for the social consequences of their actions. Sean replied that they tended to take a very legalistic black and white approach. He also note that foreign financial institutions were reluctant to enter into the Irish market due to difficulties associated with repossessions here. Dermot Mooney asked if the Credit Unions had a role to play, but Sean noted that they were currently vying for loans and he did not see an immediate role. Dermot Mooney asked what the rules for new mortgages were. It would seem that home-buyers were required to have saved 20% of the price of the property and could not borrow more than 2.5 times their combined income. There was a short break for tea and coffee before the second speaker. Niall Hayden (who is a volunteer with the Simon Community in Dundalk) gave a brief summary of the work of three agencies that provide services for the homeless, before discussing two that work in Dundalk. The first one he discussed was the McVerry Trust. This provides temporary accommodation for people over 18. However it is restricted to a maximum period of 6 months as they do not wish to develop dependency. They also provide emergency accommodation for shorter periods, and support a few families. Focus Ireland, initiated by Sr. Stanislaus Kennedy, has 70 service centres. They have very strict rules and prohibit drink and drugs on their premises. One particularly noteworthy feature is that they provide follow-up services (e.g. advice on cleanliness, shopping, etc.) after people leave the hostels. The Merchant's Quay drop-in centre is actually much more versatile than Niall had realised until recently and provide a wide range of services (medical, dental, clothes, needle exchange, contraception, etc.). They provide step-down houses for people attempting to wean themselves off drugs in Dublin, Carlow and possibly Kildare. Their 'clients' are encouraged to take responsibility for cooking, gardening etc. They have a very high success rate - possibly 90%. Niall then turned his attention to two agencies in Dundalk: Women's Aid and (the one he was most familiar with) Simon. Women's Aid, started in 1994, provides support for women (and their children) experiencing violence. They provide a phone service, court support and supported housing. They go beyond the immediate problems and give talks in schools about relationships, violence, bullying etc and where to go if you need help. For the main part of his talk, Niall provided a very interesting personal recollection of his voluntary work with the Simon Community in Dundalk. Its origins date back to 1978 when 5 or 6 volunteers under the guidance of Dolores Whelan got together to do something despite having no money or premises. They initially got a loan of derelict premises in Francis Street, Dundalk, which provided shelter for about 9 or 10 during the day, although they had to go to the County Home at night. However, the volunteers eventually had to return the premises to its owner. Having no premises, they called a public meeting which was well attended and encouraged them to set about buying their own premises. They raised money by signing up people to take out standing orders, whilst two of their committee had business connections which brought in a lot of sponsorship. This enabled them to buy a house in Barrack Street which could accommodate about 13. The Council took over the mortgage. Funding was raised by church-gate collections. In 1995 they were able to build a bigger house on the site of a nearby barn. It became a full-time shelter at this point. People staying at the Gatehouse had nowhere to stay during the day, but another premise was acquired in Jocelyn Street to provide a day centre. Initially this was only opened on weekdays, but thanks to volunteers (including Niall himself) it was recently extended to the weekends. Residents are encouraged to take responsibility. Simon operates a two-tier system. Night only residents are charge €35, full-time residents €90. The Barrack Street residents are not fully encouraged to get involved and staff interaction is not as close as it might be. It tends to be run more as an institution. Niall pointed out that even if everyone could be housed it would not solve the problem of homelessness. Homelessness is more than not having a home. He gave the example of one long-term resident who got his own house, but could not cope on his own and therefore frequently ended up in the pub. He said he would prefer to be back in Simon. After opening the floor for discussion, Paul Smyth highlighted the extent of the problem by citing the example of a Polish man who lived in a tent near Aldi. This was now occupied by 8 people who were not properly treated by Simon. Paul Gorman, who tragically froze to death in Dundalk two months previously, had also been treated badly by Simon. Niall agreed that things were far from ideal. He pointed out that there was only space for a fixed number of people. While not familiar with the details, he said he knew that a lengthy list of complaints had been investigated and rejected by what he thought was an independent arbiter. However, he admitted that there an information gap between Simon and its volunteers. In reply to Michael Challoner he agreed that Simon was evolving into a bureaucratic institution. He said there were now 36 employees, with a total of maybe 14 or 15 volunteers (including committee members), catering for 30 people staying each night. Dermot Mooney asked about the role of funders and whether they had an input. Niall explained that the County Council now plays a role in who can stay and that the centre includes 'Council beds'. People can stay 6 months but then they have to leave. However, some of those present said they knew of people who had stayed much longer, suggesting that the rules must be applied unevenly. Dermot Mooney expressed the view that there seemed to be a duplication of services. Niall summarised it by saying that Simon looked after those in the shelter and Focus Ireland those outside. Sean Crudden observed that there was too much bureaucracy and that there were too many agencies competing for limited resources. Niall agreed and gave the example of how a man discharged from Lourdes Hospital at the weekend could not be accommodated because he had not got proper permission from an official who did not work at weekends. The overriding impression was that the system was not operating very efficiently due to bureaucratic inefficiencies despite the selfless work over the years of people like Niall Hayden. The final speaker was Michael Challoner who began by distributing a short article about a homeless man in Canada whose life had been turned around after being provided with a one bedroom apartment under a scheme run by the Mental Health Commission of Canada. One of the striking features was that people in the scheme were provided with access to medical, and mental health care, addiction counselling, work opportunities and other integrated supports. The scheme was so successful that it was estimated that for every $10 invested in the scheme $21.72 was saved in the health care, justice and social services sectors. Although Michael had what appeared to be a carefully prepared script, his 'talk' soon developed into a question and answer session. Sean Crudden wondered if there was scope for a more institutional approach for those who found it difficult to cope without backup services. Niall Hayden, however, doubted whether the political will existed and noted that there were few votes in homelessness. Michael Challoner noted that 25,000 homes were at risk of repossession because they were more than €50,000 in arrears. Don Johnson noted that 20,000 to 30,000 housing units had been taken in by NAMA, but the Government was only interested in selling them to vulture funds. 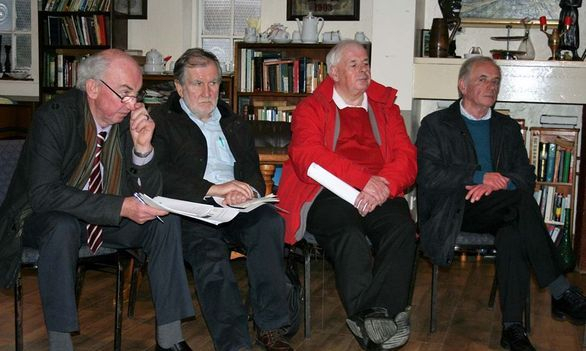 Michael, however, pointed out that the Local authorities rejected 1,064 homes offered to them by NAMA, due to them not being suitable for social housing or they would have resulted in an 'undesirable' tenure mix. The numbers rejected varied considerably by local authority. Louth only rejected 3 out of 30 homes offered to it, but most local authorities rejected much higher percentages. Dermot Mooney asked what role Housing Associations play in the Republic, pointing out that they seemed capable of providing housing at low cost in the North. However, no-one seemed to know much about how Housing Associations operated either north or south of the border. Teddy Crudden suggested that we needed to return to local authorities building their own houses using direct labour. Michael Challoner agreed noting that local authorities do not employ tradesmen, so private developers can name their own price. Local authorities have a duty of care and are best placed to identify local need. Also, land was available, and unlike private developers, local authorities do not build for profit. Ultimately the Government has responsibility, so people should urge the Government to do the 'right thing'. Dermot Mooney, however, argued that direct labour would inflate costs because the workforce would be unionised. Andrea Corrigan noted that the casualisation of labour was an important issue as it was becoming increasingly difficult, especially for young people, to get a mortgage without the security of a permanent position. Also, even casual work requires so much documentation that it can cost a small fortune even to qualify for a causal job. There seemed to be consensus that we were now over-regulated. Eamonn O'Boyle brought the proceedings to a close, noting that we were almost back to Famine times. He said in summary that we suffer from too much regulation and bureaucracy. More pictures taken at the 2017 Workshop may be viewed here.